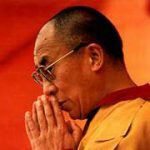 His Holiness Tenzin Gyatso, the 14th Dalai Lama of Tibet is the spiritual leader of the Tibetan people. He was born Lhamo Dhondrub on 6 July 1935, in a small village called Taktser in northeastern Tibet. Born to a peasant family, His Holiness was recognized at the age of two, in accordance with Tibetan tradition, as the reincarnation of his predecessor the 13th Dalai Lama, and thus an incarnation Avalokitesvara, the Buddha of Compassion. 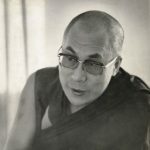 Forced into exile in 1959 by the illegal Chinese communist colonization of Tibet, which continues to this day, he has continued to inspire the Tibetan people and also inspires millions of others the world over. In 1989 he received the Nobel Peace Prize for his unwavering advocacy of a non-violent solution to China's brutal occupation of his country. 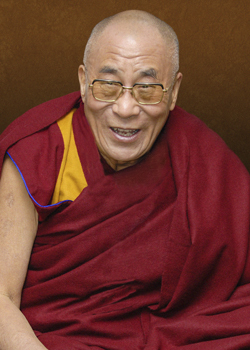 Read His Holiness' complete biography here. 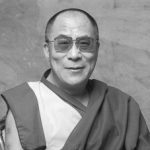 You can also visit His Holiness the Dalai Lama's website, sponsored by the Office of His Holiness in India. 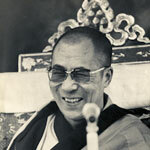 View the Pictorial Portrait Project on a special web site also sponsored by His Holiness' Office. A teaching given prior to a ceremony for generating the mind of enlightenment (bodhicitta), May 7, 1998, Washington, New Jersey. A talk given on the need for a greater sense of human community in order to bring about peace in our world. 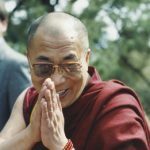 A teaching given on the Four Noble Truths in Dharamsala, India, October 7, 1981.